Desperate for funds, she cooks up the (illegal) plan to make and sell moonshine with her friends. Quickly realizing they're out of their depth, they turn to Mason, a local boy who's always seemed like a dead end. As Mason guides Lulu through the secret world of moonshine, it looks like her plan might actually work. But can she leave town before she loses everything? My Best Everything is Lulu's letter to Mason--but is it a love letter, an apology, or a good-bye? All ages, not just teen fiction. Such a clever and original debut book! I fell in love with this fun, funny, original, honest, and heartbreaking story. I'll be first in line for this author's next book! 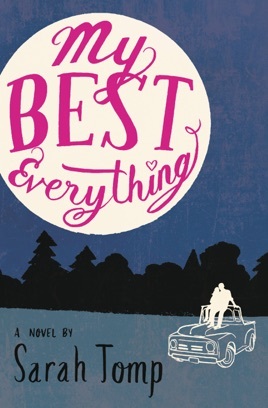 A coming of age story unlike any I’ve read before, told in second person past in letter form, it is the explanation of events and self of Lulu, a new high school graduate in the small southwestern Virginia town, best known for the lack of opportunity. But Lulu was meant to be different, with her acceptance to UC San Diego and opportunities to make a new life away from the sheltered town, she has one last summer before her life begins anew: the girl who always did her best and believed that education was key. Not all is going as planned though, when her plans are turned upside down and there is no money for her education. Lulu is understandably devastated, and turns to an always available option: drinking. During her first experience, she meets Mason, a year older and a high school dropout, his family is known in the area as moonshiners, and he is dealing with his own alcoholism. Through the retelling of the story, we see just how desperate and determined Lulu is to get out of town and move on to college, and just how much she is willing to sacrifice to gain her own exit. Contrasting with that is Mason, in a journey of his own to change his life, even when it seems, at first glance, that he has few options available to him. The dynamic is an interesting one as insights and events are presented with the benefit of hindsight, but feel so utterly honest and emotionally available. Every character is presented through Lulu’s point of view: with her own observations and suppositions, even as she does infuse some hopes and dreams into much of the retelling, it isn’t always hopes or dreams fulfilled. There are so many different elements at play in this letter: from betrayals that wounded deeply at the time but feel almost fated, to consequences, family dynamics, first loves and all types of obligations. Each element unfolds and reveals itself gradually and gently, as Lulu seems to come to terms with the events, and what is and isn’t possible in the now. A lovely coming of age story that gives a glimpse into the ‘wrapping up’ of childhood with that final summer before university and all the growth that occurs.